While the US –Russian and EU- Russian partnerships are moving in a bright allay, working on monetary and energy options that will further cement the existing relations, nothing prohibits Russia to act alone to increase geopolitical stability. If it is true that visa waiver, borders opening, Ruble merger in the Euro, and further nuclear US/Russian control, are significant measures ahead, it is also true that boosting defense cooperation and increasing trade volumes are pivotal to reach unprecedented phases of international peace. It is widely known that the US modern Grand Strategy already evolved to partner greatly with Russia and to extensively concert with China. This approach is very effective to reach an era of consulting and peaceful global governance. Open areas for cooperation are still there like energy, water, food, natural calamities, WMD proliferation and UN reforms, but the basic work is set for US-EU-Russian integration and concerted acceptance with China to move forward and proceed. How the US economy will recover remains the main question, and unless important steps are taken by lawmakers, this international requirement will not be addressed. How can peace activists spur US consumer spending, manufacturing and new households is easy to realize if we look into many ideas being floated recently. There is need to elaborate a major fiscal plan where tax cuts for middle/low income will be renewed/expanded for 3 years, but for high incomes only for one year while imposing on these, a condition to commit for at least two start ups in the coming 12 months. There is also need to introduce an incremental VAT on a limited basket of commercial items, furthermore to open the US for new immigration with a target to reach 450 million inhabitants in 2050. To complete the action a rational plan to transform public waste into wealth should be put in place and also a clever framework to reduce debt gradually with no harm to the efforts for recovery. Rumors are spreading if the Fed will recur to another quantitative easing or if there will be need to another stimulus, and I say that the approval of a special unlimited package at this stage to fund startups initiated from August 2010 to August 2011 and reduce to zero their regulations will have a better impact on all sectors. These actions will sedate the volatility and make the fourth quarter a turning point. Coupling Modern Grand Strategy to economic recovery is a main understanding for activists of peace while focusing on the area stretching from China to Portugal. The US modern Grand strategy acting as a ballerina, will recover the US economy, integrate with Russia, concert with China, secure energy routes, stabilize Iraq and facilitate the establishment of a democratic government after the general elections, entice a diplomatic solution with rational factions in Afghanistan for the benefit of the civil society, dissuade the Iranian guards from their nuclear pursue, resolve the Israeli Arab conflict and widen international cooperation. However in doing so, we need also to consider the steps taken by other powers, simply because the geopolitical mosaic is widely interconnected. Fear should not be a factor impeding China from rising peacefully in its region, or Russia to perfect a consortium with Iran. A growing responsibility of both is a gain for world citizenry in the same way as the peace role of the US is an added value in Eurasia. Looking into the upcoming Gala in Washington on September 1st, observers are hoping for a deal in the making between Palestinians and Israelis. Excellent would be to agree by mid September on a Federal Palestine. 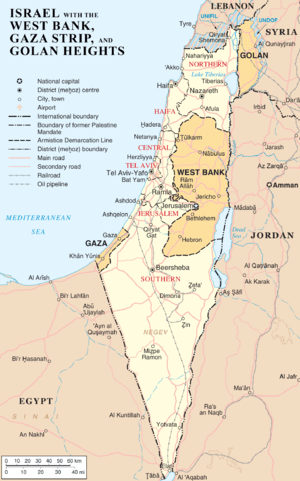 The new demilitarized state can be declared temporarily in the West Bank (98 % of 1967) as a first state, in January 2011 with its temporary capital Ram Allah. Outstanding issues of additional states, final borders, viability, Jerusalem and refugees will be finalized by 2013. Opposition to a likely agreement will be strong and will rise from a pervasive array of sort; we can expect veiled threats of instability to continue striking in Iraq and Afghanistan for now, yet there is no escape for both contenders the NPA and Israel than to find a common ground. Failure is a nightmare. PR exercises practiced from one side by Hezbollah in frequent TV shows trying to subject the Lebanese STL to threats or quid pro quo’s and from pro- Israel writers resorting to Atlantic interviews to legitimize a non recommended Israeli attack on Iranian plants will ultimately fail in their objectives. As we know the last tripartite summit in Lebanon, the French designation of a peace envoy, and the clashes this week in Burj Abi Haidar do confirm my assessment that the perimeter of the theater of regional confrontation is limited to Lebanon to enable a diplomatic/political breakthrough in world affairs. My view suggested to put in place surrounding bases to Iran, a defensive/offensive build up coupled to strong sanctions leading the Iranian regime to cripple, implode and thus to negotiate the terms of its surrender. It seems that the IRGC is willing to start negotiations, but to reach out to the Iranian mainstream we need to strengthen the stick and cut Hezbollah tentacles in Lebanon. This requirement will reveal very precious in the negotiations, as the IRGC will have lost a negative card Hezb but gained a positive one the Consortium with Russia. Basically we are changing the cards in hand of the counterpart and this will enable the US to come clean at the end of September/October having two agreements in place one for Palestine and one with Iran. From above, strategic terms impose that Hizb will be deprived from its military assets, to reach global peace and power equilibrium. Therefore the international consensus for the Casus Belli (Federal Palestine, security of the state of Israel, Iranian negotiations and Peace in the Middle East) is well in place and advancing. An oyster policy will oblige Hizb to disarm or else to be reduced to a relic by an overwhelming, disproportionate, fast and irreversible action that will promote peace successfully. Being in the midst of the campaign to disarm Hizb, I can safely say that it is inevitable for ISraeli armors to roll by September/October into Lebanon. Hizb has two choices, to lose power and reposition itself, or to fight on multiple fronts and lose the totality of its military assets. I was expecting the STL to announce its indictment on September the second to exert the most pressure, yet the interview of Bellemare on Now Lebanon suggests a different scenario. Therefore I reconsider and tend to put the indictment to be simultaneous to the upcoming conflagration. Hizb loss in Lebanon will favor a rapprochement between all players on the China/Portugal mainland/surface. “Pax Riduttiva” will prevail. The Syrian army, the LAF and Hamas would best stay idle or they will bear dire , very dire consequences. Hizb loss and the Russian offer will shuffle the cards in hand of the IRGC and consign to US negotiators the key to a pragmatic deal. The only alternative to the pragmatic deal will be a US strategic/tactical bombardment by the end of November. Failure of the US to act swiflty on the Iranian nuclear file, will inevitably introduce a “Masada Doctrine”, where Israel will act alone, in a different perspective, where cards are not required . The Syrian nation following the new direction will benefit largely as much as a new Lebanon will benefit from the monopoly of coercion exerted only by a modern LAF, responding to an enlightened doctrine of defense. Reforms of both states will remain a major issue to tackle and the installment of a democratic stability will be the main objective of the elites. The IRGC needs to put the ball in the nearest hole, thus, limit damage and surrender. This entry was posted on Thursday, August 26th, 2010 at 2:48 pm and is filed under Modern Grand Strategy. You can follow any responses to this entry through the RSS 2.0 feed. You can leave a response, or trackback from your own site.